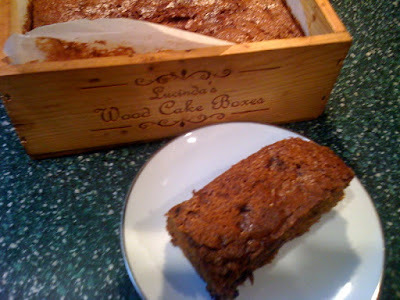 Kathy Edwards came up with this recipe to make in her Lucinda's Wood Cake Box. As always, Anne is is the kitchen baking. Harry Lowe headed over for a taste and to try out his new iPhone. He was a little too close, but he'll get better! Whip sugar and egg together until fluffy, and light in color. Slowly incorporate vegetable oil and molasses. Combine dry ingredients and add to egg mixture alternately with buttermilk. Combine until smooth. Fold in blueberries that have been tossed lightly in Tbs. flour. Pour into greased and papered cake pan (follow cake box guidance for prepping box). Bake at 300 for 30-40 minutes, or until top springs back when touched lightly. When the gingerbread is baked, Kathy cuts it in squares, smears the top with some lemon curd, sprinkles that with some coarse sugar, and then lights her torch and brulees the top - it is magnificent according to her sister, Nanci.